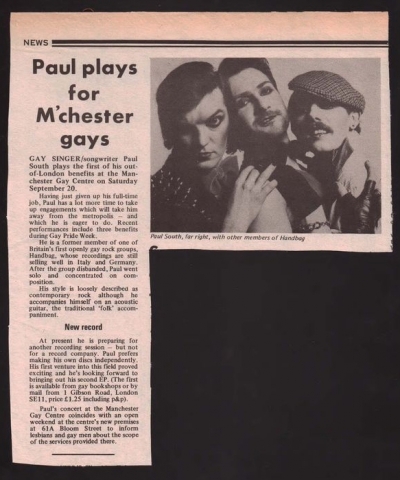 Paul South, a former member of the largely forgotten but pioneering out gay rock band, Handbag form London, plays a gig at Manchester's Gay Centre, which at this point was on Bloom Street. ran a youth club and launched a light night café called SNAX to bring in much needed revenue. Mancunian Gay, a magazine, (later Gay Life) was also launched in this basement, as was Lesbian Express (but that only lasted for 3 issues!)." Eventually, in 1988, funds were raised for a purpose-built LGBT Centre in Manchester on Sidney Street (the first of its kind in Europe) and it remains there to this day.